In the field of bioanalysis, the analysis of a target analyte and its metabolites in biological fluids (urine, plasma, and blood) is predominantly the main activity during animal and human trials. As such, a wide range of extraction and analytical techniques are used for qualitative and quantitative analysis. The sensitivity of the high resolution Xevo G2-S QTof approaches tandem quadrupole MS capabilities and demonstrates it to be fit-for-purpose for a large number of routine assays and analytical workflows. In the crowded CRO landscape, being successful means addressing service gaps that can be filled by smaller, dynamic and more flexible organizations. New start-ups need to fully survey products and technologies, and capitalize on those that will allow them to differentiate and to position themselves competitively. Drs. Liz Thomas and Sally Hannam discuss the story of Alderley Analytical's journey from concept to a state-of-the-art GLP-compliant bioanalytical CRO. See how Xevo TQ-S StepWave Technology can increase the sensitivity for the bioanalysis of low-exposure pharmaceuticals and their metabolites in plasma and blood samples. Includes antibodies and small molecules. This white paper provides an overview of Waters' QuanTof technology. 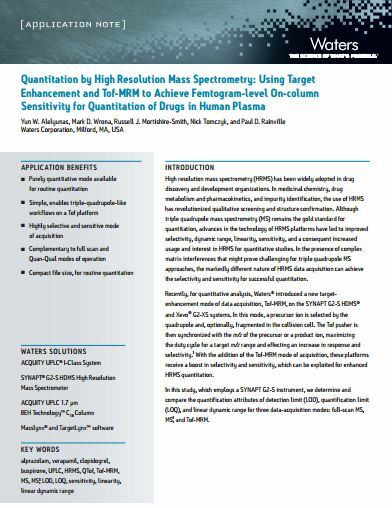 Waters’ QuanTof technology enables orthogonal accelerating Tof mass spectrometers to deliver fast, high-resolution, accurate mass, quantitative results simultaneously. This blog summarizes a workshop where thought leaders discussed Ion Mobility Spectroscopy (IMS), its use in contemporary structural characterization, and the promise that the technology holds for the future. Microflow LC-MS is a challenge. Only a few do it well, and even fewer do it well consistently. And for those who have had success, their methods can completely fall apart when being transferred to other analysts and labs. Without robustness and the ability to adopt into routine use, microflow LC-MS has remained a tool relegated to research applications. This blog post summarizes the appeal of microflow LC-MS. This white paper illustrates loop vs. trap injection Process for multi-dimenstional chromatography. This white paper illustrates trap and elute versus at-column dilution process for multi-dimensional chromatography. Uncertainty in chromatographic method development and quantitative experiments often arise when co-eluting unknown interferences, which reduces performance. This white paper describes the utility of RADAR to attenuate the impact of unknown interferences while maintaining high quality analytical performance. We evaluated two methods to improve LC/MS sensitivity for our bioanalytical assays further: (i) a new API source where ionization is achieved through interaction of a high velocity droplet stream, and (ii) high sample volume injections on a 2D μUPLC system using chip based ionKey/MSTM technology. This conference report provides an overview of the discussions at the 2nd European Bioanalysis Forum (EBF) Focus Meeting ‘Large Meets Small’ held on 20 and 21 June 2011 in Brussels. Absolute protein quantification by LC-MS/MS is an important tool in assay development and creating data for systems modeling. Enabling predictive biology is one of the primary goals of many system biology studies, achieving detailed knowledge of the cellular constituents, their quantities, dynamics, and interactions. 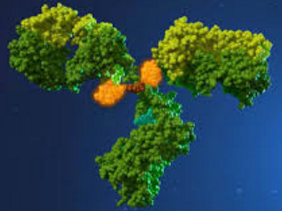 The determination of drug-to-antibody ratios (DAR) and sites of conjugation present unique analytical challenges that can be addressed with Waters' fit-for-purpose UPLC, QTof MS and informatics solutions. 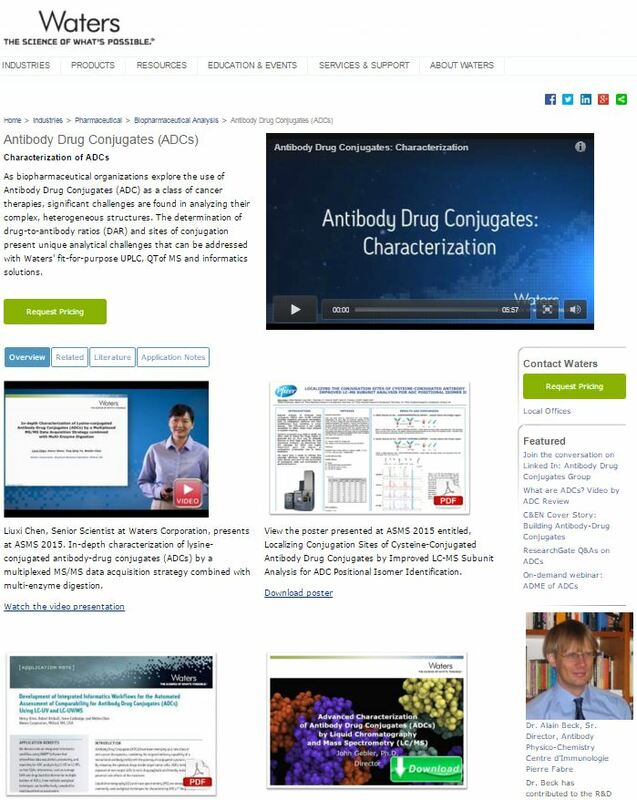 Sponsored by Waters, Bioanalysis Zone explored the analysis of antibody drug conjugates (ADCs), the unique bioanalytical challenges they pose, and how those challenges are being addressed. Are Analytical Chemists Going Extinct? In this blog, the idea of an 'endangered' analytical chemists is explored. They face a myriad of obstacles today – lower than average job forecasts, costly and timely training, demand for more versatile knowledge, tighter regulations, and massive data management requirements. What do you think? 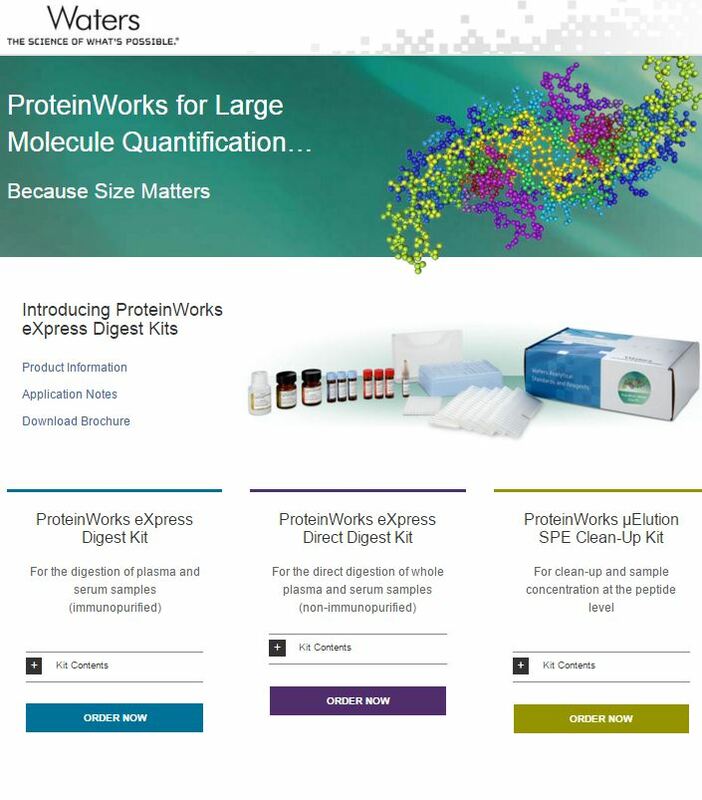 Routinely achieve reproducible, accurate, and sensitive protein quantification with ProteinWorks, Waters new family of protein bioanalysis sample preparation kits. With the potential to allow targeted delivery of anticancer drugs to tumors, with minimal impact on normal tissue, there is increasing interest in ADCs in new drug development. This interest is highlighted by a robust pipeline of ADCs in pre-clinical and clinical development. 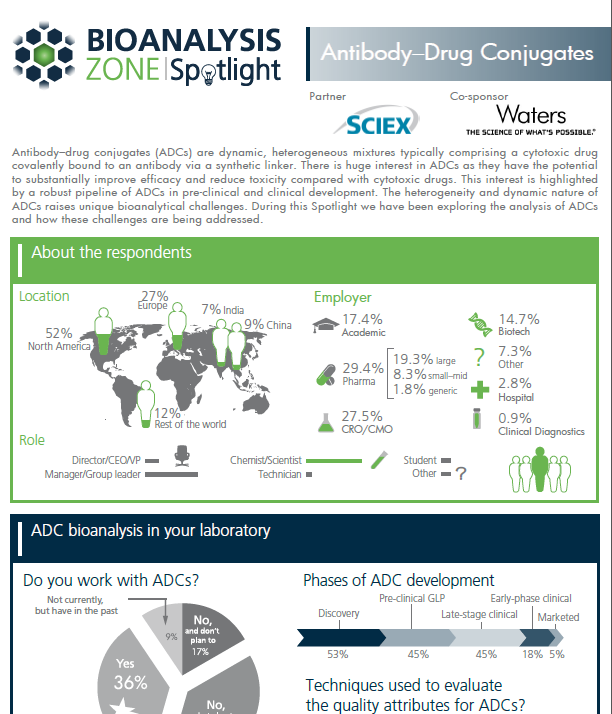 The heterogeneity and dynamic nature of ADCs raises unique bioanalytical challenges, which is explored as part of Bioanalysis Zone’s Spotlight on ADCs. As the pharmaceutical industry continues to shift more toward biologics and hybrid drug entities, it becomes increasingly imperative that the small and large molecule bioanalysis worlds work together to efficiently arrive at go/no-go decisions. This webinar will address these trends as well as the impact on drug development and regulatory requirements for drug approval. Recently, targeted LC/MS-based methods have been applied to quantitative proteomics, facilitating highly accurate and multiplexed relative and absolute quantification studies. Both triple quadrupole and high-resolution mass spectrometers have been used. Benchmark studies of the Xevo G2-XS QTof suggests it is >1000 times more sensitive than those introduced just 10 years ago. 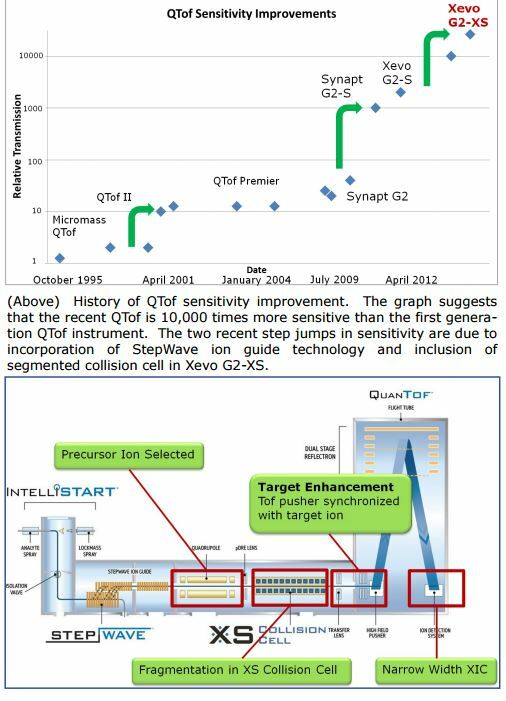 This jump in improvement can be attributed to both StepWave ion guide technology and a new collision cell design that minimizes background noise, improves ion focusing, and reduces losses in ion transfer. Teriparatide, the 1-34 fragment of human parathyroid hormone, is used to treat osteoporosis patients with a high risk of fracture by stimulating new bone formation. 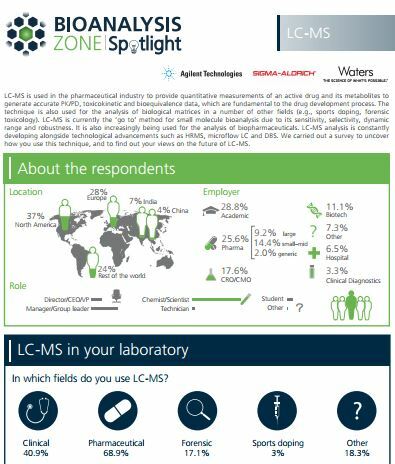 Bioanalysis Zone surveyed scientists from all over the world across different types and sizes of organizations to better understand how bioanalysts apply LC-MS methods in their respective fields and how it may change techniques and approaches in the future. Is Ion Mobility Mass Spectrometry Child's Play? Waters is making ion mobility as easy to use as your cell phone or your remote control. 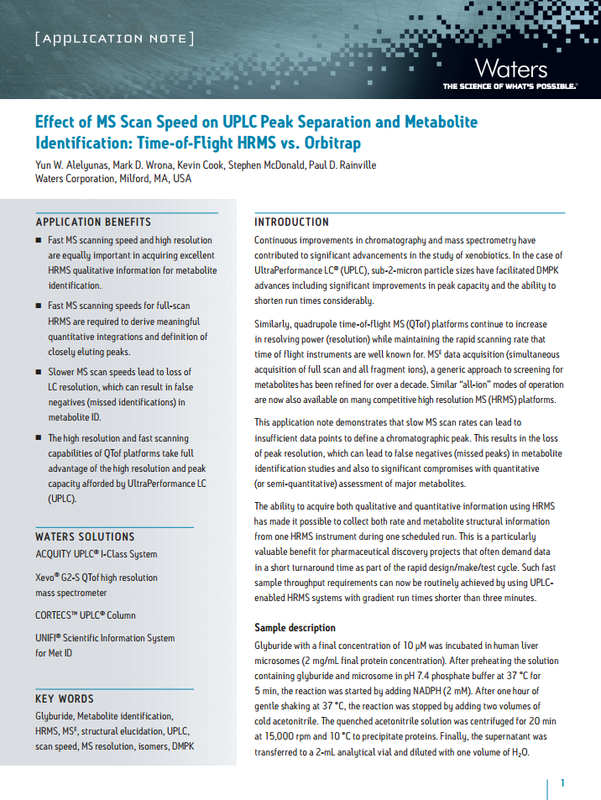 Take a look at this blog describing the merits of ion mobility for routine mass spectrometry. This blog examines how the move from small to large molecules is creating new challenges for analytical labs, including fewer molecules in equal volume per analyte; possible loss of analyte due to complex sample prep; reduced signal due to increased fragmentation; and many others. This work provides a multidimensional method for the simultaneous, direct quantification of intact human insulin and five insulin analogs in human plasma. 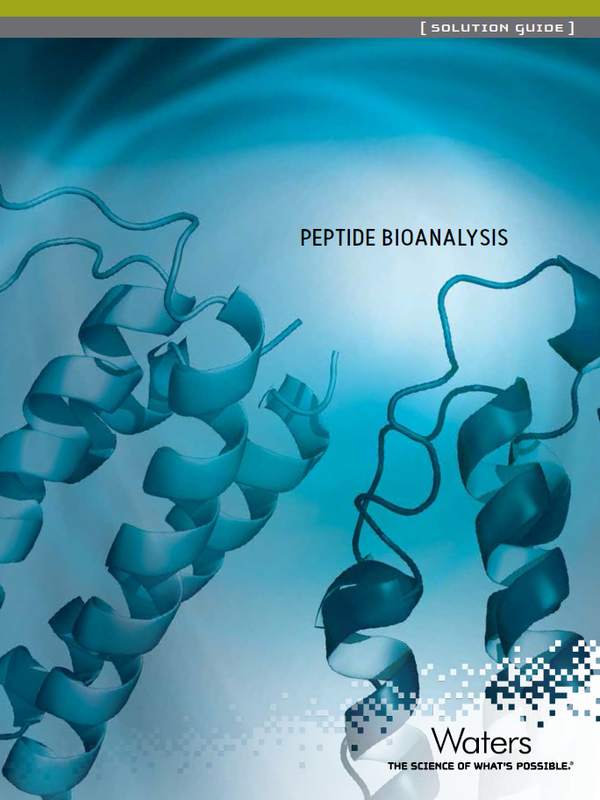 Employing LC-MS for the bioanalysis of peptides requires the extraction of the target analyte from a matrix of biochemically similar proteins and peptides. However, we have seen that the most common techniques employed for small molecule extraction, such as protein precipitation (PPT) and liquid-liquid extraction (LLE), do not provide the recovery, sensitivity, specificity, and assay robustness required. Learn about Waters' sample preparation protocols and separation conditions that will help you quickly and effectively develop methods for any peptide. Peptides and Proteins are not Small Molecules; Why Treat Them the Same? 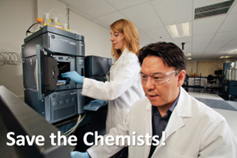 Large molecule quantification is one of the greatest challenges that bioanalysts face. Sensitivity and specificity issues are numerous: fewer molecules per volume; increased fragmentation; limited recovery due to complex sample prep; and so on. Learn why Waters is leading the industry in large molecule bioanalysis. This new application notebook contains 9 detailed application notes focused on biologics quantification using LC/MS. 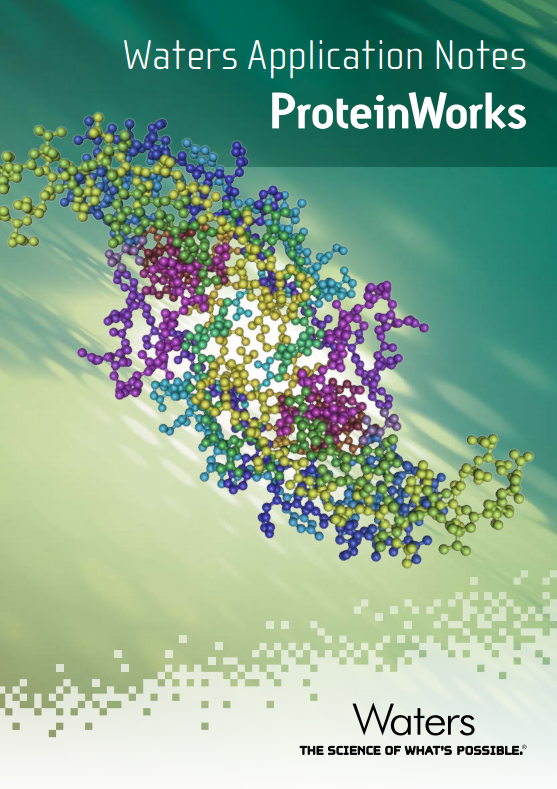 ProteinWorks are a set of kits that facilitate the surrogate peptide method (protein digest). This notebook contains key examples of accurate, sensitive, and reproducible quantification of protein therapeutics including mAbs and ADCs. 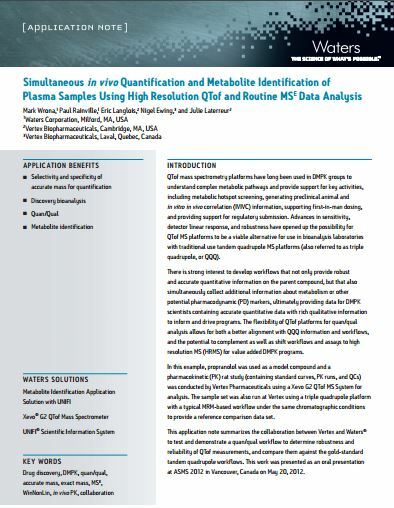 This application note demonstrates the benefits SYNAPT G2-Si System for the quantification of proteins and peptides in a new High Definition MRM (HD-MRM) mode. Dr. Chris Evans (Director Bioanalytical Sciences and Toxicokinetics, GSK) showcases case studies where HRMS facilitated adaptable bioanalytical study support to: overcome challenges associated with selectivity; understand molecular integrity; and facilitate intact analysis. This blog examines two themes that emerged from the 11th annual Applied Pharmaceutical Analysis conference: small and large molecule centers are no longer separate silos; and scientists are increasingly frustrated with unclear regulation surrounding ADCs. This blog post discusses some of the highlights from the Peptide Bioanalysis Forum in Copenhagen, Feb 3-4, 2015. 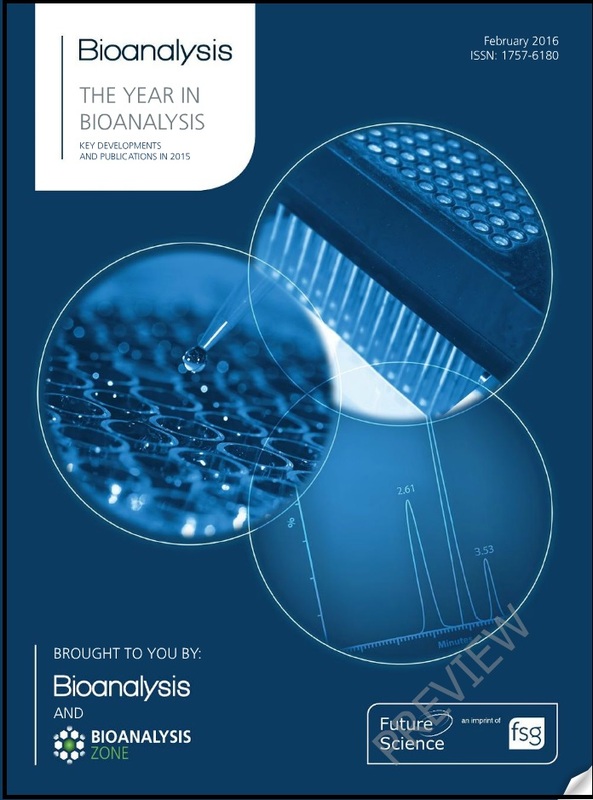 In this publication, the utilization of chip-based separation devices coupled to MS for analyzing peptides/proteins, glycans, drug metabolites and biomarkers for various bioanalytical applications are evaluated. Advances in HRMS have led to improved selectivity, dynamic range, linearity, and sensitivity, In the presence of complex matrix interferences that might prove challenging for triple quadrupole MS approaches, the markedly different nature of HRMS data acquisition can achieve the selectivity and sensitivity for successful quantitation. 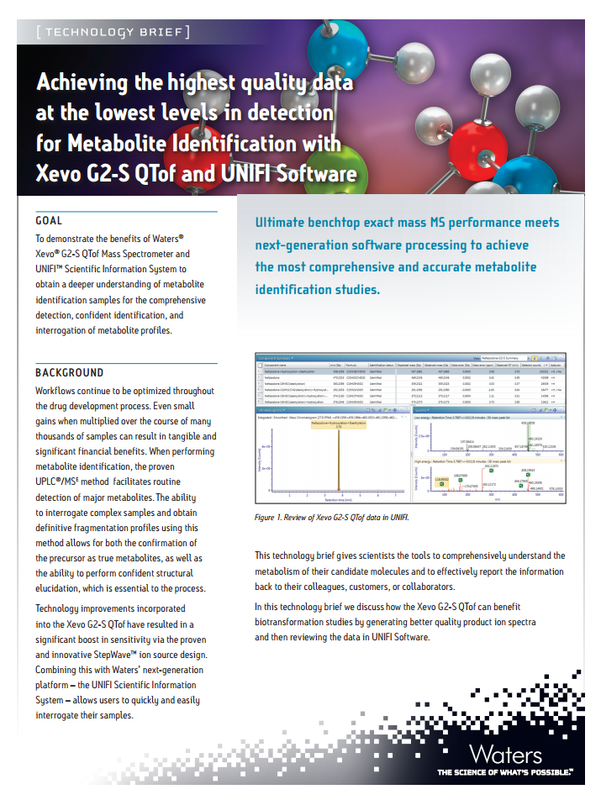 Comprehensive detection, confident identifcation and complete characterization of drug metabolism samples is achieved using HRMS QTof technology, UPLC and intelligent informatics. In this webinar, Dr. Xiaogang (Sean) Han of Pfizer, Inc. and Stephen McDonald of Waters Corporation discuss the workflows that are being employed to measure and profile ADCs, and describe the tools and techniques that are being successfully deployed in this growing area. This technical brief outlines a simple rapid approach for the detection and analysis of drug candidate metabolic profiles. Using MetaboLynx and the built-in chemical intelligence tools allow the scientist to confidently assess compounds and perform complex analyses. 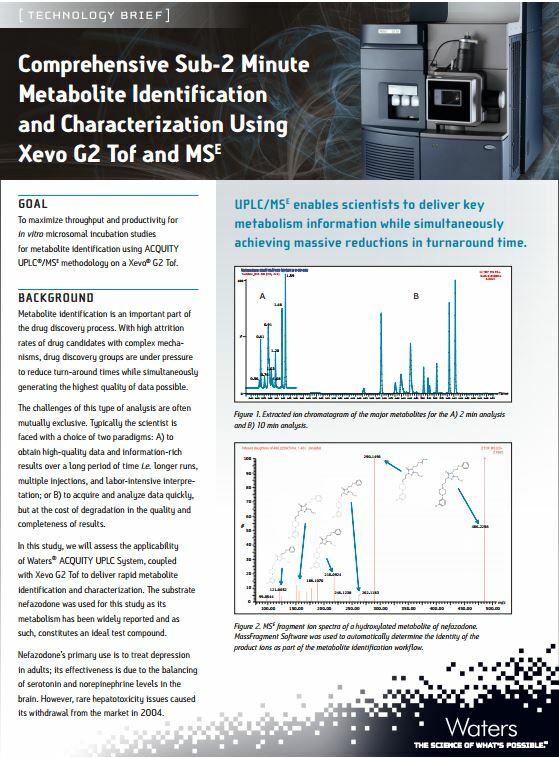 Harnessing UPLC/MSE and high resolution bench top instrumentation, such as the Xevo G2 Tof, provides scientists with the tools to carry out relevant studies and generate data to help inform key program decision makers, and drastically reduces turnaround time. Slow MS scan rates can lead to insufficient data points to define a chromatographic peak. This results in the loss of peak resolution, which can lead to false negatives (missed peaks) in metabolite identification studies and significant compromises with the quantitative (or semi-quantitative) assessment of major metabolites. ASMS 2015 presentation: Russell Mortishire-Smith talks about next generation DMPK workflows, achieved through tight integration of ion mobility, HRMS, informatics, and data reduction strategies. Advances in sensitivity, detector linear response, and robustness have opened up the possibility for QTof MS platforms to be a viable alternative for use in bioanalysis laboratories. This application note summarizes the results of a quant/qual workflow to determine robustness and reliability of QTof measurements, and compare them against the gold-standard tandem quadrupole workflows. Combining metabolism expertise with the best exact mass LC/MS system available, this business case demonstrates how one CRO delivers more complete metabolic structural information to their clients in less time. 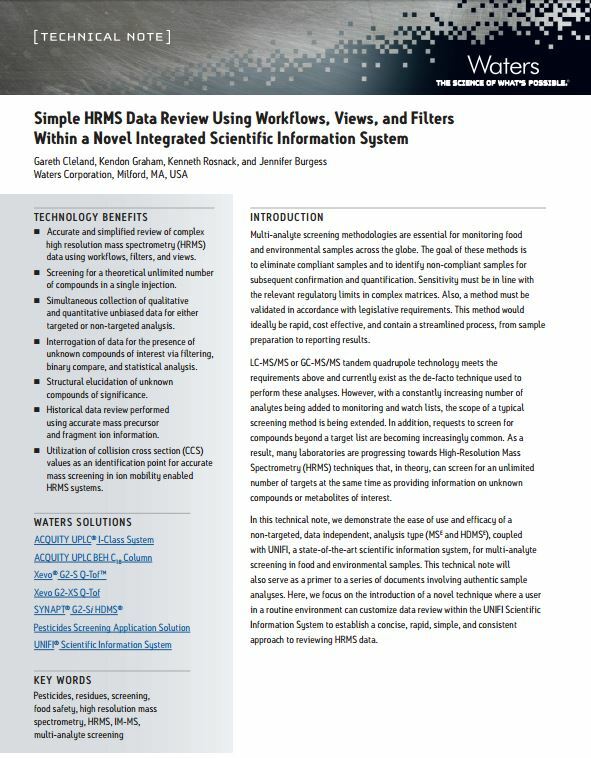 In this technical note, we demonstrate the ease of use and efficacy of a non-targeted, data independent, analysis type MS(E) and HDMS(E), coupled with UNIFI, a state-of-the-art scientific information system, for multi-analyte screening. Cris Lapthorn (Univ. of Greenwich) and Russell Mortishire-Smith (Waters) share exciting new work in the field of ion mobility separations (IMS) and collision cross section (CCS). This white paper summarizes the discussion and recommendations from a recent EBF Focus Workshop into an updated recommendation for metabolite quantification in drug development.